The Coffee Bean Bracelet and Earrings - Limited Edition are pieces of chainmaille jewelry that add vintage Swarovski coffee bean crystals to the chainmaille weave. The coffee bean crystals were made by Swarovski in the 1960's and the supply is limited. From the picture, note how the crystal is carved to look like a coffee bean. This sample utilizes pink coffee beans. Other colors that are available are light blue, sapphire blue, montana blue, clear crystal, jonquil (light yellow), amethyst, red, teal, emerald and fuschia (deep pink).This kit will only be sold for as long as we have the coffee bean crystals available. You utilize a simple wire wrapping technique to add the coffee beans to the chain. 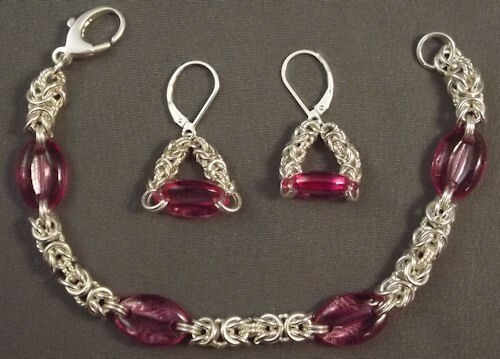 The kit will come with six coffee beans so that you can make the bracelet and matching earrings. Please only select one set of coffee beans per kit purchased. The coffee beans are not sold separately, only as part of a kit. When selecting coffee beans below, you are choosing the color only. The earring findings and the clasp are not included. This is a beginner project.